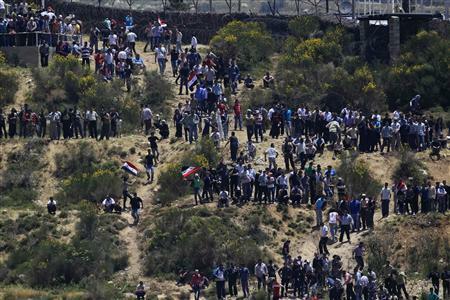 For a month the turmoil’s also known as “Arab Spring” has reachedSyria. 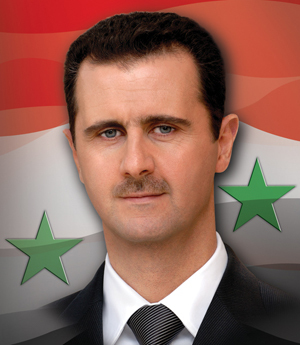 President Bashar al-Assad battles with the upmost brutality. Thousands of dead protesters shock the world and the ultra liberal Europeans don’t seem to understand why nobody is willing to take action against the tyrannical dictator. As usual the European Leftist media launches the standard accusation against the United States and the United nations, claiming that they don’t care about the dead because Syria has no oil to offer. Unlike Libya who is one of the richest countries in Oil and gas resources. Europe is the largest business partner inLibya, Europe obtains the majority of its oil and gas needs (Austria for example a total of 25% of its Oil and Gas needs) from Libya. The United States is only allowed to pay for the War they fight on behalf of the hypocritical Europeans. But back to Syria and the claim nobody seems to care about the dead protesters and the genocide produced by the local government. Claiming economical interest or the lack of the same is way too easy and way too far from reality. The truth is that politics is like a chess game. And every chess player knows one always thinks three moves ahead. And that is the real reason why the United Nations cannot surmount itself to harsher sanctions against Syria. Syria is already a financially and economically challenged country and lives mostly on its banking system, providing the bank accounts not only for Saudi Countries, but also for Iran. Iran has tough UN resolutions on their back and cannot, like any other country, perform its business publically. Syrian Banks provide the opportunity forIran to buy and sell all kinds of goods from Russia, China, and other Iran-friendly countries, performing and processing bank services. That also includes payments from and to Terror organizations. Also, Saudi Arabian Countries finance “questionable Groups” through Syria. Payments Saudi Countries do not want the U.S.to know about in order not to jeopardize their Oil business. Criminalists would call it money laundering. And then there is the United Nations and here is the chess game that comes in. Between Syria and Israel is the so called UNDOF unit. United Nations Disengagement Observer Forces, with order to protect and uphold the weapons hold status between Syria and Israel. 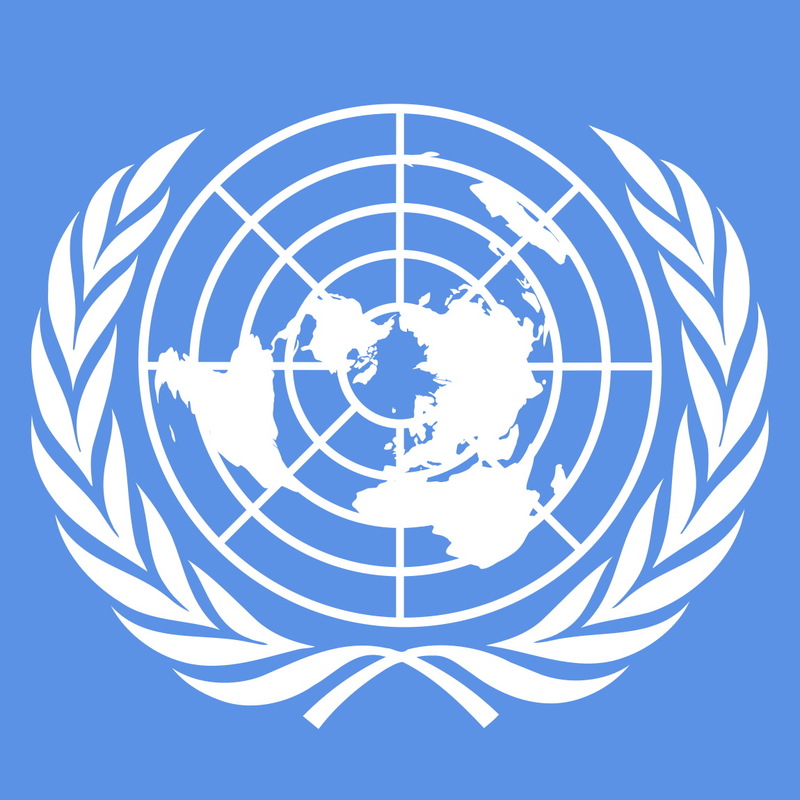 But the UN is not an occupant and is only there because Syria agreed to it in a contract, which means if Assad feels betrayed by the UN he can easily and without giving any explanation withdraw the permission to have this unit on his soil and that would be devastating for the UN and their radical upcoming agenda in September. Let’s play that through for the moment. The United Nations not only strongly condemns, but also punishes Syria for its genocide even threatening military action, and Bashar al-Assad withdraws his permission having UN peacekeeping soldiers on Syrian property. That is what Iran is waiting for. 427,000 Palestinian refugees from Lebanon will immediately come over the Golan Heights smuggler routes joining forces with 478,000 Palestinian refugees inSyria. 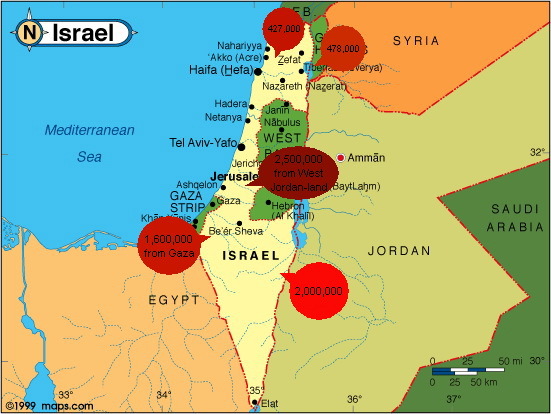 With practically no puffer provided by the UN forces 905,000 Palestinians will make a run forIsrael’s borders trying to overrun them. Israel will have no other choice than to gather the majority of its troops on the Syrian border in order to stop the flood of Palestinians. 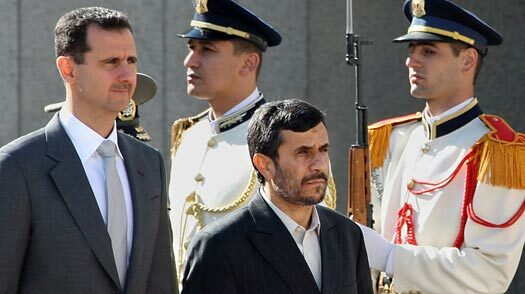 This is exactly what Ahmedinejad of Iran needs, claiming an Israeli attack on Syria, which allows him to come to the aid of his “Syrian brothers”. Meanwhile, the borders to Gaza and the West bank are weakened and an additional 4.1 Million Palestinians (2.5 Million from the West Bank and 1.6 Million from Gaza) attack Israel seeing their chance to finally do what Hamas and Hezbollah dream of – the final destruction of Israel and the taking over of the entire country. And if anybody thinks the remaining 2 Million Palestinians inJordan can be stopped they are a fool. As of here the world has only 2 choices: Sit back and watchIsrael die or interfere with a combined force which will end in a long-lasting brutal war if not a world war or worse a nuclear war. 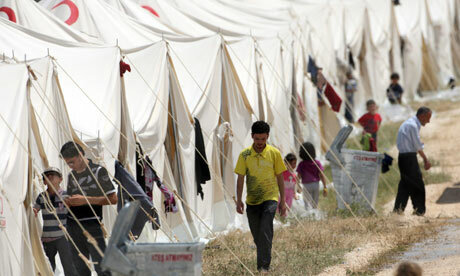 4,300 Syrian refuges are already inside Turkey, the Financial Times reports and thousands more are to be expected. In case of an outbreak of war on Syria those refugees could easily become guerilla fighters having enough support in a highly muslimized country like Turkey. The third World War would be on. Either way the radical UN Agenda of building a Palestinian state in September recognized and accepted by the world community is nothing more than wishful thinking. The United Nations keeps doing what they do best, hold meaningless negotiations and weak condemnations against Syria assuring that Assad is not too offended and the situation clears itself up. That way their radical Agenda of building a Palestine State in September is not in jeopardy at all. Bottom line is: European allegations that the world does not interfere because of lack of resources is nonsense. The U.S. does not interfere because it is not our problem and the UN considers the slaughtered victims inSyria collateral damage for their higher Palestinian Agenda in September.